"You will not be far from wrong if you described the Savannah Region as the least developed part of the Northern Region. 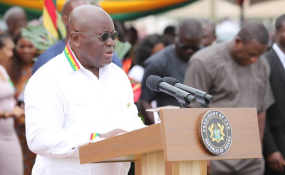 The irony in all of this is that the Savannah Region is blessed with an abundance of natural resources," the President bemoaned. Additionally, the constitutional threshold, which demanded that, at least 50% of the persons entitled to vote cast their votes, and, of the votes cast, at least 80% cast in favour of the demand for the creation of a Region to succeed, was emphatically met, as 99.70% voted 'yes' for the creation of the Region. "The onus now is on Government to put into motion the processes for the rapid development of the Savannah Region. Not to be caught unawares in the event of a successful 'yes' vote for the creation of new regions, the Minister for Finance, Ken Ofori-Atta, in presenting the President's Budget Statement and Economic Policy for the 2019 Financial Year, announced that a seed capital of GH¢20 million had been allocated for each of the six new regions for their smooth take-off," President Akufo-Addo said. "My Government is committed to the growth, progress and success of the Savannah Region, and we will work to make sure this happens," the President added. "Secondly, Damongo has been chosen as the capital of the Savannah Region. I want to assure residents of the Region, however, that Government projects and structures will be equitably spread across the Region," the President stated.